It's nice to see something that I helped with become a part of a bigger picture where it can grow and prosper. I was the Forward Thinker and Director of Product Innovation for Sling Media, helping to launch the second generation products and the initial video content recognition and rules engine behind the Clip+Sling portal. The folks at Echostar, who market their satellite service as Dish Network, have agreed to purchase my former employer and the creators of the Slingbox for $380MM. This is an interesting purchase for them, even as an initial investor, as they may get some backlash from their premium content providers like HBO, ESPN and the like who feverishly fight to keep their content locked to as few devices as possible, unless additional revenue is pushed into their coffers. Dish network is no stranger to network fights as it has dropped Viacom and CBS channels in 2004, Lifetime in 2005 and and Court TV in 2007 due to the networks attempts at rate hikes. The channels have gone "dark" but have each come back after their "we own the pipe to the consumer" tactic of negotiation. They also have been under attack from TiVo for not licensing the DVR technology while building their own around patents TiVo owns. This could also mean that TiVo, which is the peanut butter to Sling's chocolate, could stop promoting Slingboxes on its store and through its rewards shopping site. Sling's CEO Blake Krikorian has stated that "By combining strategies, resources and technologies with EchoStar, Sling Media will be able to rapidly expand our open multi-platform product offerings, not only for DISH Network subscribers, but for digital media enthusiasts around the globe." This means users will still be able to sling content from other providers, even DirecTV. Echostar will be riding a double-edge sword while pushing the innovation envelope, giving consumers new ways to enjoy services that they subscribe to while convincing the media outlets that they purchase content from, that it is in every one's best interest to let consumers enjoy more content in more places. An interesting achilles heel to the network providers is that Dish does not provide the upstream bandwidth to "sling" content outside of the house, which providers may feel would break their carriage contracts. Dish partners with Wild Blue to provide its DSL Internet service, and StarBand for satellite Internet access which is a high-latency and slower service of the two that does not have the upstream bandwidth for an acceptable quality of service. 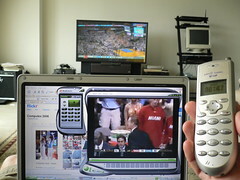 Because of this, they could argue that the Slingbox makes a much more compelling in-house experience (something half of the initial customers surveyed said that they were using the hardware for) to a laptop or the upcoming Slingbox Catcher, than adding another satellite receiver and TV in the home. I have always respected Charlie Ergen, who in 1980 sold C-Band "BUD's" or Big Ugly Dishes out of his car in rural Colorado, and dreamed of having his own satellites in space. In 1996 that dream came to a reality thanks to Ku-Band and MPEG-2 technologies. When we were building the Communication Expo stores, we merchandised his new Dish Network service against the Hughes funded DirecTV, and it is a true David meets Goliath story with Charley putting up a great fight against the big corporation. So kuddos to your team for seeing the innovation and strong leadership created by Blake, Jason, Bhupen and the engineering team and executed by John and his team. You have a multiple award winning technology that needs to thrive. Be proud of their 2007 Emmy Award for Outstanding Achievement in Advanced Media Technology for the Creation of Non-Traditional Programs or Platforms! I am! Echostar press release to Acquire Sling Media. Sling Media's press release announcing the purchase by Echostar. My good friend and former Sling co-worker Jeremy Toeman's take on the buyout.